I was 13 years old when I saw the Jimi Hendrix Experience in 1969. Infatuated with music even before the emergence of The Beatles, I was stunned by the concert experience of standing close to Hendrix as he created sounds unlike any other musician. An incredibly creative era in rock music was just beginning, and my interest in writing came from nothing more than a desire to spread the word about these exciting new sounds. As a young kid I'd made my own books, including an illustrated account of the planned Apollo lunar landing missions, carefully documented on paper stolen from my father's typewriter and stapled together in a limited edition: one of one. As a freshman in high school in the immediate wake of the Hendrix experience, I found an outlet with record and concert reviews in the school newspaper, spreading the gospel of musicians like Emerson, Lake & Palmer and Mahavishnu Orchestra. Doors began opening, and I found outlets for my words in Philadelphia publications, covering the area where I lived. I wrote for the highly-regarded underground newspaper The Drummer, where my editor was David Fricke - now music editor of Rolling Stone. I began to place reviews and interviews in publications outside the local scene, and soon rock stars ranging from Grace Slick to Robin Trower found themselves being interrogated by the young me. Playing my own music and promoting concerts dominated the 1980s, but I also began a ten-year stint as music columnist for Philadelphia City Paper. After leaving that post, I contributed music coverage to Philadelphia Weekly. Meanwhile, a story I'd written about Dale Earnhardt's crew chief, who had roots in the Philadelphia area, had interested me in NASCAR and stock car racing. The idea of creating a book - a real book, not one stapled together - took root, and I convinced NASCAR to help give racetrack access to me and my photographer partner, Rick Farnkopf. This led to the publication of my first book, Sunday Drivers: NASCAR Winston Cup Stock Car Racing, a full-color coffee table publication which won "Book of the Year" in an STP-sponsored competition among professional motorsports journalists. I remained in the NASCAR realm for years, contributing to a number of racing magazines and newspapers. At the same time, I was given the opportunity to write a biography of Jimi Hendrix, whose music had been inspirational both to my writing and my guitar playing. And that Hendrix connection has remained strong, with articles about Jimi for general interest and Hendrix-specific publications around the world, as well as contributing to the Hendrix family's own Experience Hendrix magazine - not to mention writing a second book about "the man with the guitar," 2018's acclaimed Modern Listener Guide: Jimi Hendrix. 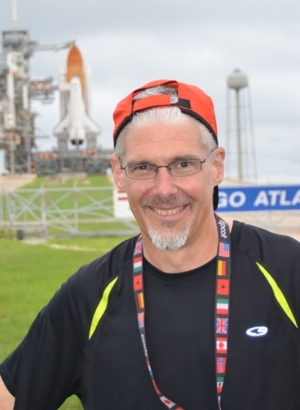 In recent years, writing provided me with access to the final flight of the space shuttle program, as I spent the summer of 2011 at Kennedy Space Center witnessing the preparation, staging, and successful conclusion of the Atlantis STS-135 mission. I've been fortunate in writing in that I've always been able to cover things that are of interest to me - things that I'm excited to tell others about through my written words. That's what I wanted to do with my first columns in the school newspaper all those years ago; it's what I still want to do today. © 2018-2019 Frank Moriarty - All rights reserved.